These vintage enamel 'buckets' were made in Bengal, India in the 1940's. 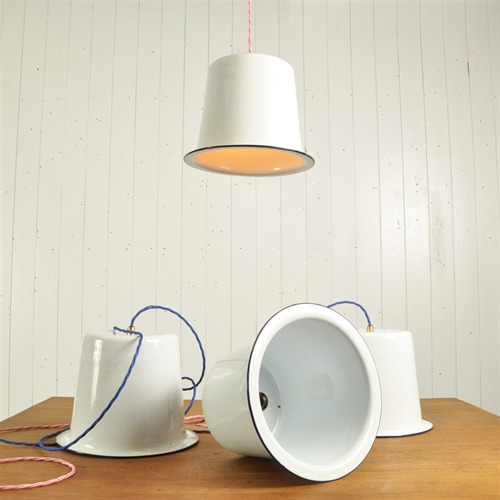 We have converted them into these quirky pendant lights that although upcycled still have very clean lines and simple form with the interesting detail of the blue enamel line around the rims. We love a line of these above a bar or as a cluster in a stairwell. These have modern brass E27 Bulb holders and can be supplied with black, blue, brown, red or pink triple braided flex. There are some chips / imperfections to the enamel. 26 cm h x 28.5 across. 6 available, priced and sold individually.